A home air filter is easily forgotten. It does its job all alone in the basement. Day by day it’s taken for granted. Meanwhile, it gets full of tiny particles and, after a while, stops cleaning the air so well. Time for a change, if you remember. If you don’t it’s hello allergens. Not just that, but your system has to work a lot harder to keep the house warm or cool. A good home air filter keeps pet dander, mold spores, dust and pollen from polluting your air. Changing your filter regularly is a must to keep your air safe and ensure your HVAC system works at peak efficiency. Here are some valuable tips to help you choose the right filter for your home. The first thing to know is the size of your filter. Remove the existing filter to get the dimensions. Don’t skip this step. There are too many different sizes available to play it by ear. Most residential HVAC systems use a 1-inch thick filter. But some homes use ones up to 4 inches thick because of the volume of air circulating through the home. There are adjustable filters for non-standard ventilation openings, as well. The air filter should fit tightly in the opening. Don’t by a thinner or smaller one because it’s easier to install. Choose the thickest one that will fit. The thicker the filter, the better. Thicker filters capture more particles and last longer. If possible, consider having an HVAC professional modify your system to accommodate a thicker filter. Size isn’t the only reason there are many filters available at your local home improvement store. Filters are rated based on how well they do at capturing particles. The main way filters are rated is using the minimum efficiency reporting value, or MERV. This system was developed by the American Society of Heating, Refrigerating, and Air-Conditioning Engineers. A higher number means more particles are filtered out. The minimum filter rating you should use in your home is 6. Per Consumer Reports, the top performers in their tests generally have a MERV of 10, or higher. There are other rating systems for filters, like MPR. This is 3M’s Micro-Particle Performance Rating. Filters are rated based on how well they capture airborne particles smaller than 1 micron. The highest performers have MPR’s between 1500 and 1900. The Home Depot uses its own rating system called the Filter Performance Rating, or FPR. The scale is 1-10 – the higher the rating, the more effective the filter. Size and rating aren’t the only criteria, though. There are many types of filters to choose from too. Air filters use a variety of different materials and methods to trap particles and keep them from circulating throughout your home. Below are the most common. Inexpensive woven fiberglass filters have a single function. They block dirt and debris that could damage your furnace’s blower motor. They do remove some pollen and mold spores but that’s not their main job. If you consistently replace them each month and air quality isn’t a concern, they’ll work just fine. If you want a filter that works somewhat better than fiberglass and needs replacement less often, consider a pleated one. These are also inexpensive and they need to be replaced approximately every 3 months. The pleats create a larger surface area, up to 4 times as much as fiberglass. This allows them to catch smaller particles for a longer period of time without affecting your furnace’s airflow. An electrostatic filter has cotton or paper fibers inside that self-charge to attract small particles. These filters are a good alternative in homes with smokers or pets. They cost more than pleated filters but are still relatively affordable. Electrostatic filters are available in disposable and permanent styles. The permanent kind can be removed, washed and reinstalled. This allows them to last for 6-8 years. If your home has an atypical filter size, electrostatic filters can be on the expensive side, which will add up when using the disposable ones. For folks with special situations, like allergy sufferers or those with autoimmune disorders, standard filters may not be enough. High-efficiency filters using True HEPA technology are extremely effective at removing contaminants from your air. These filters are part of an overall air filtration system that combines a pre-filter with a HEPA filter and a charcoal filter. The result is hospital-grade air filtration, equivalent to MERV 16, or higher. Certain systems can be easily integrated into your existing heating and cooling system. If you remember nothing else from this article, remember to change or service your filter regularly! The best filters can’t do their jobs right if they’re clogged with particles. Refer to the manufacturer’s recommendation for how often your filter should be changed. Keep in mind air filters work harder in the summer months, when the air conditioning is running regularly. This happens because many blower motors run at a higher speed for air conditioning than they do for heating. Change your filter more often in the summer. Another thing to remember is if there’s remodeling or construction going on in your home, your filter needs to be changed more often, as well. Remember, a clogged air filter doesn’t only affect air quality, it makes your furnace or air conditioner run less efficiently. Something to know about pleated filters is clogging can cause overheating. When your unit overheats, it shuts down the burner. After this happens a few times, the limit switch will fail and the furnace won’t fire up. This results in a visit from your friendly neighborhood HVAC technician. The average cost for the part and service call is $175. Ouch! Bet you didn’t know something you take for granted is such an important part of your HVAC system. An air filter that balances particle filtration with unrestricted airflow allows your system to run at its best while keeping your air clean and safe. Look at all your options and choose your next air filter wisely. Questions about air filters or your HVAC system, in general? Contact us. We’d love to help! What is My Water Heater Life Span? Unless you’re living in a tropical country, a reliable water heater is critically important to your quality of life. If your water heater goes bust during winter months, it may not just be an inconvenience. This is a major appliance whose function can really affect your whole family! So, how much do you know about your water heater? What is a water heater life span? In this article, we’ll explore some important questions and give you insight on how to ensure you never go without hot water. There are basically three types of water heaters: conventional tank heaters, tankless heaters, and hybrid heaters that are basically a combination of the first two. Conventional tank heaters store water in a tank and keep it continuously heated up to a predefined temperature. They vary in capacity and efficiency and can take up a lot of space. The main advantage of conventional tank heaters is that they are economical and reliable. Tankless heaters heat water with an electric resistance element or a gas burner, providing hot water on demand. They are typically more expensive than conventional tank heaters and have a longer water heater life span, but take up much less space and reduce energy consumption. Hybrid heaters combine a tank with on-demand heating. They can be fairly expensive, but live for a long while and can deliver more hot water faster than a standard gas or electric water heater. If properly maintained, a typical tank water heater can last for about a decade, while a tankless heater that’s not overused can last twenty years. Even if your heater seems to run perfectly, consider replacing it if it’s more than a decade old, as no heater is designed with more years in mind, and it may suddenly break down. The most common issue with tank heaters is a leaking tank, but how do you prevent something like that? It turns out that you can, to a large extent. By flushing the tank to drain sediments, and by checking the anode rod annually, you ensure the inside of your heater is rust-free and safe from damage caused by sediment. When it comes to tankless heaters, depleting them regularly due to overuse may cause damage to the interior lining and make them deteriorate faster, reducing their water heater life span. The pressure relief valve will reduce pressure in a tank heater to prevent mechanical damage from high pressure. A stuck valve can lead to leaks, and in dramatic cases even heater explosions! The pressure relief valve is typically on top of your water heater and opens automatically when pressure reaches a certain threshold. To check it, just place a bucket below and slowly open it to test if it’s working. It’s best to do so when the heater is full but NOT working, so the water is cold. Replacing the pressure relief valve is easy as most models allow you to just unscrew the old one and screw back the replacement. Note that if you’ve never tested your valve and your heater is several years old, you may cause it to leak after testing it. Replace immediately if that happens. In order to drain the tank, first turn off the heat. Electric heaters will just have an ‘off’ button, while gas heaters might have a dial that goes down to ‘0’. Then, shut the valve that feeds the water heater and then turn on the hot water (any faucet will do) to drain the water inside the tank. Leave this faucet on for as long as you want your tank to remain empty. Again, it’s best to wait several hours from turning off the heat to draining your heater, to allow the water to cool down. You don’t have to empty your tank to remove sediment. A few gallons from the bottom will do. Just keep emptying until you see the water come out clear. If sediment is left in the tank for too long, it can solidify and become impossible to remove. Obviously, if your heater is leaking, it’s a clear sign that’s something is going wrong! Leaky heaters almost always need replacement, but a professional plumber might be able to repair it if the issue is localized, and especially if it’s the pressure valve. Red, yellow or rusty water: This indicates that your heater has rusted internally, but may be also caused if piping is rusty. To make sure it’s not your heater, drain it ASAP as indicated above and see what’s going on. Lower water temperature: If water feels colder even if the temperature settings haven’t changed, then your heater might be malfunctioning. Shut it down and call an expert. Rumbling, banging and other weird noises: Unusual noises can mean sediment buildup or other nasty problems. If you get this problem early, you may get away with just flushing sediment, but if you ignore rumbling noises, you may have to replace your heater sooner than you expect. In today’s interconnected world, water heaters are just one of many elements that make a modern house efficient and pleasant to live in. If you seek a comprehensive way to manage your home and all utilities, you should consider an efficient and cost-effective smart home bundle solution that will give automate your home the smart way and give you peace of mind. 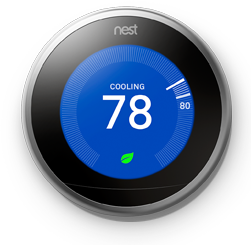 Smart home bundles can cover everything from heating and cooling protection, to smoke detectors and smart locks, to proper annual maintenance that will maximize your water heater life span. Contact us today to find out how the leaders in smart home solutions in Canada can help you!